Hubby invited his 2 officemate for lunch today. Everytime we have visitors, he always wants me to prepare Pilipino Foods or any Asiatic Foods. 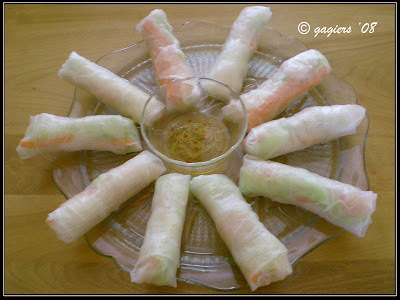 I did this fresh spring rolls as an entre and usually they love it very much. It's my first time doing this kind of rolls. It's very simple and you can put anything inside. * Bring a medium saucepan of water to boil. Boil rice vermicelli 3 to 5 minutes, or until al dente, and drain. * Fill a large bowl with warm water. Dip one wrapper into the hot water for 1 second to soften. Lay wrapper flat. In a row across the center, place 2 shrimp halves, a handful of vermicelli, carrots, and lettuce, leaving about 2 inches uncovered on each side. Fold uncovered sides inward, then tightly roll the wrapper, beginning at the end with the lettuce. Repeat with remaining ingredients. 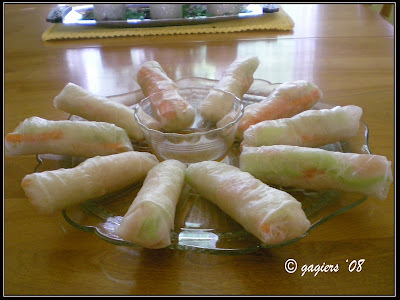 * Serve rolled spring rolls with spring roll sauce.